Doing up your home? We say ditch the mainstream products and get a little artsy with these handmade products from ExclusiveLane that have tribal paintings, embellishments, and more. If you prefer your home decor pieces to have a character of their own, a wooden lamp with hand-embellished Madhubani art should fit right into your aesthetic. This one depicts an elephant with a plant motif in earthy tones, has a jute shade, and will stand out in any part of your house. We waved goodbye to room fresheners the moment aroma diffusers came into play, and this one's shaped like a tea kettle. It's made from glazed ceramic and depicts studio pottery done by craftsmen. Got the reading bug? This set of tree shaped bookends are perfect to hold your favourite reads in place. It's carved out of Sheesham wood and is completely handcrafted. Got guests coming over for tea? Ditch the cups and break out this set of kulhads. Embellished with rustic paintings depicting tribal scenes, the kulhads are handmade in terracotta and look amazing. 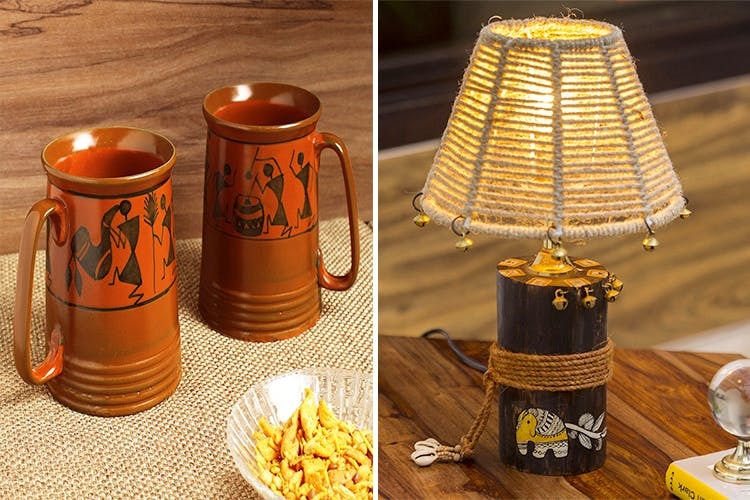 Drink it up old-school with these ceramic beer mugs–they've got Warli art depicting traditional motifs of dancing merry figures, men playing musical instruments and riding horses and the whole thing is glazed in a tone of brown. Cheers!